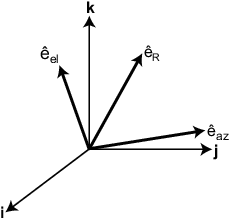 A = azelaxes(az,el) returns a 3-by-3 matrix containing the components of the basis(e^R,e^az,e^el) at each point on the unit sphere specified by azimuth, az, and elevation, el. The columns of A contain the components of basis vectors in the order of radial, azimuthal and elevation directions. At the point located at 45° azimuth, 45° elevation, compute the 3-by-3 matrix containing the components of the spherical basis. The first column of A contains the radial basis vector [0.5000; 0.5000; 0.7071]. The second and third columns are the azimuth and elevation basis vectors, respectively. where each component represents a column vector. The following figure shows the relationship between the spherical basis and the local Cartesian unit vectors.